I always considered my self blessed that I grew up in the golden era of Hip-Hop and Alternative rock. The 80’s and early 90’s produced legendary acts like RUN-DMC and Public Enemy to Jane’s Addiction and the Red Hot Chili Peppers. Every generation will have their greats but I will never hesitate to say that we had it Gooooood. One of my favorite parts of growing up with a brand new genre and culture such as hip-hop, is watching it grow and expand its horizons. 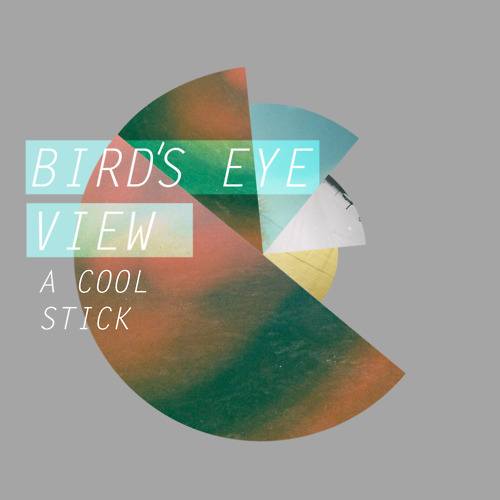 After catching the top videos of the week, shaking my head in dismay, I received an e-mail like a refreshing breeze from the band A Cool Stick complete with their new EP A Bird’s Eye View. This Baltimore quartet have definitely taken Hip-Hop down their own path. Vocalist Luke O’Brien puts down life affirming, party raps with a relaxed melodic flow. Recently discovering he could also sing added a new level to the EP, which gives it a new sound from previous projects. The band is composed of well-rounded artists. Princeton music student Matt Wong is on Bass, Guitarist Sean Mckeon still takes weekly lessons even though it’s obvious he doesn’t NEED to and Drummer Brian Aranda started the spark and vision with Luke back in 09, and have they’ve been building ever since. The power of live instrumentation is on full display on tracks 1 and 2 Water and You Are. Track 4 Smile has a Jamiraquai-esq live disco vibe, sure to get the ladies dancin. Besides the new EP the band has been busy showing their live skills with a recent New York album debut, performances with Sam Adams and Citizen Cope also a hot opening spot for Beck and Stalley in their Baltimore and D.C. shows. I recently got the chance to ask them a couple of ?’s about all the new Cool Stick buzz, here’s what they told me. Sikboy: What elements and/or experiences went into the new EP? ACS: “We’ve grown A LOT since our first EP. Since then we’ve had some line-up changes in the band, and Luke put out his solo project, The Dopeness. This was our first opportunity to get something that was really representative of where we are in our lives, and as musicians. This is a much more mature, thought out product than our first release, and we’re extremely proud of it. Overall, recording is always a great experience, and we’re looking forward to writing and writing and writing”. How was the recent New York debut? The Hippie Girl video looked fun, are there plans for more video’s? “The Hippie Girl video was a blast, and there’s definitely plans for more videos. We want to make a video for every song on this EP, and those are in the works”. What do you guys have going on right now, how can people find it? I’m looking forward to watching A Cool Stick take flight. In the meantime I can always twist one and vibe to A Birds Eye View when I need an escape. I highly recommend everyone do the same, the hustle and bustle of the world isn’t going anywhere, here’s the link. ← G~Eazy – Welcome to Endless Summer. Great write-up. I’m very excited for everyone to hear what’s next. Look out for The Doperness coming soon! Thank you, sounds awesome let us know.